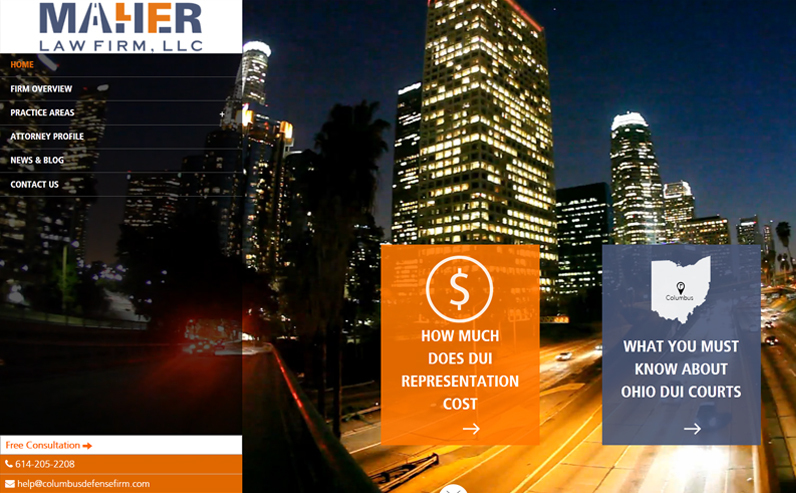 Maher Law Firm is a leading DUI/OVI and criminal defense law firm in Columbus, Ohio. We teamed up with Columbus web design and marketing company Cynexis Media to strategically redesign our website and align it with our goals and mission. Our new and improved website has a strong design, user-friendly layout, and dynamic, engaging atmosphere. The custom site comes equipped with a content management system (CMS) and is built with HTML5 and CSS3. The background of the home page displays a time-lapse video that adds a completely new dimension to the site. Maher Law Firm’s responsive website caters to the needs of everyone from desktop users to mobile users. The simplified navigation menu allows prospective clients to explore Maher Law Firm’s different practice areas and services. The blog’s new three-column layout minimizes the need for scrolling, so users can view multiple article titles at once and click or tap on the ones that interest them. Users can click the icon in the upper right-hand corner of the blog to view and explore article categories. Users can get in touch with our firm quickly, thanks to the “free consultation” form on the site’s main navigation menu. Our new contact page also has a form that allows prospective clients to submit their questions and comments with ease. Overall, Maher Law Firm’s new website boasts a clean, professional design that draws visitors in and offers a user-friendly experience. The newly developed site makes it easier for prospective clients to find the information they’re looking for as well as communicate directly with our firm.